You know how sometimes you put on a skirt that you think is an appropriate length and then you walk somewhere, say, to work, through a predominately Muslim city, and you realize your navy blue skirt has hiked up and your white slip has fallen down? Well, you certainly can’t keep walking like that because a short skirt (over green tights mind you) is still better than part of your underwear hanging out. So, I slipped behind a few trees next to Thai Sushi this morning, waited until I couldn’t see anyone passing, and pulled my slip off under my coat and over my boots. It was not pretty, but it was fast. Now the cat calls will remain at a normal level instead of the “I can see your lacey slip” level. In other clothing related news, we went to our first fashion show a few weeks ago and felt like complete frauds. We sat on the front row in our black outfits and nodded our heads knowingly after the show when people said things like Can you believe those models? They were amateurs or Wasn’t that velvet jumper just divine? For the record, it was. The fact that I know luxurious fabrics, Indian inspired brocade and Asian shapes are “in” this year is beyond strange to me. But I have to say, the whole thing was a lot of fun. I fussed and fussed about what to wear and in the end wore a black cocktail dress. Boring, I know, but the idea of showing up in a purple prom dress surrounded by Casablanca’s elite clad completely in black gave me nightmares (literally). At first it was a bit strange to see these girls, because that’s what they were, parading down a white carpet with steely eyes directed towards the slew of press at the end of the runway; but after a few girls walked past me, close enough to reach out and touch them, I noticed they didn’t really look like the airbrushed waifs we see on TV. Up close some had frizzy hair, bad skin, bulges, and one had a gnarly looking thing on the top of her left foot. Not that I sat on the front row and tried to pick out flaws in the models to feel better about myself, but seeing them up close made me re-visit the lie the media tells us about bodies – our bodies and “their” bodies. The lie that ours are gross and “theirs” are flawless. I actually left with a better sense of confidence in my own body and the idea that we all come in different shapes, skin tones, and foot health. Last Friday morning Max and I pulled out of our garage to see a large sheep, hanging from a tree with most of its skin yanked down around its hooves. A man, a nice man we have come to know and really like, stood next to the sheep in a bloody apron wielding a large, very sharp knife. “Aid Mubarak!’ I said to Max as we drove past our neighbor instructing a small child how to release the flesh from the meat of the animal. Last weekend was Eid Al Adha when Muslims all over the world commemorate the willingness of Abraham to sacrifice his first born son Ishmael. Each family who can afford to do so must purchase a sheep and slaughter it on the morning of “L’aid” as it is referred to here. The meat from the sheep is divided into three parts: one is kept by the family, one given to friends or relatives and one is given to the poor. What this kind of ritualized mass butchering looked like to non-Muslim observers like myself that Friday morning was a kind of zombie-esque end of days scenario on the streets of Casablanca. Men walk around covered in blood, 12 inch knives, still dripping, carried in front of them and buckets of sheep guts at their side. They wear galoshes to protect themselves from the rivers of blood that claim the gutters. Small groups of teenage boys roast sheep heads on open flames all over the city and carts of freshly removed sheep skins are ferried about for sale. Outside of the impromptu bbq’s and weapon wielding men the streets are empty and the shops are all closed. It’s not that we don’t like religious observances, we do, but I am not the hugest fan of blood so we carried on right past our friendly neighbor-come-butcher and escaped to the mountains. Morocco has great cities with amazing recorded histories, but it also has great undeveloped areas. 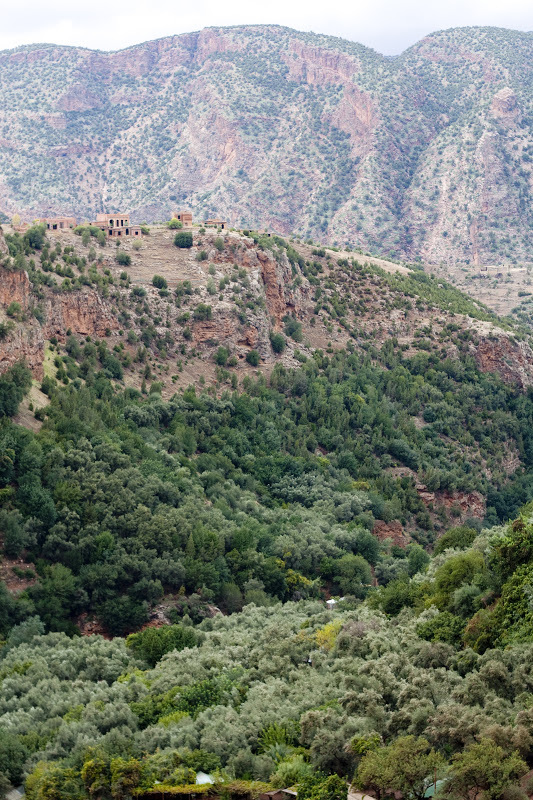 These areas were once referred to by the French as “Bled-al-siba" which translates roughly to “The wild places”. 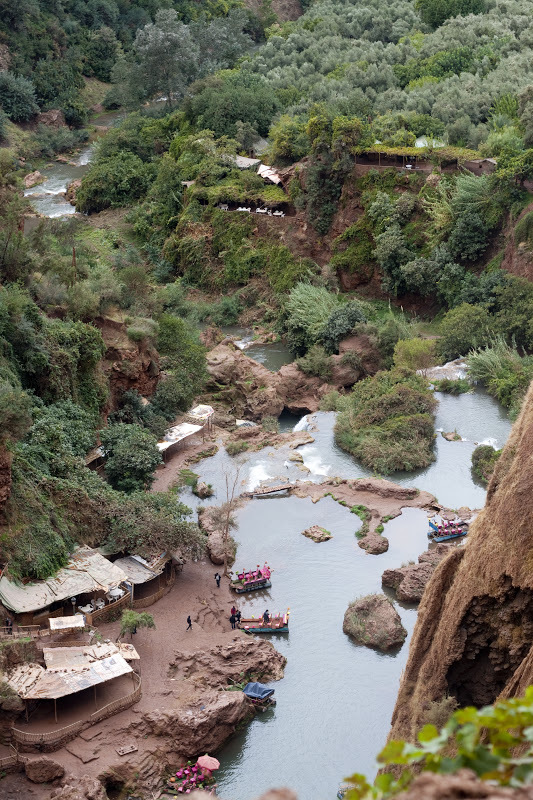 Places where sultans, chieftains and kings never could quite get a handle on the population and Berber tribes pretty much kept to themselves. These places are much more developed than they once were, but there is still an “off the grid” kind of feel to them. 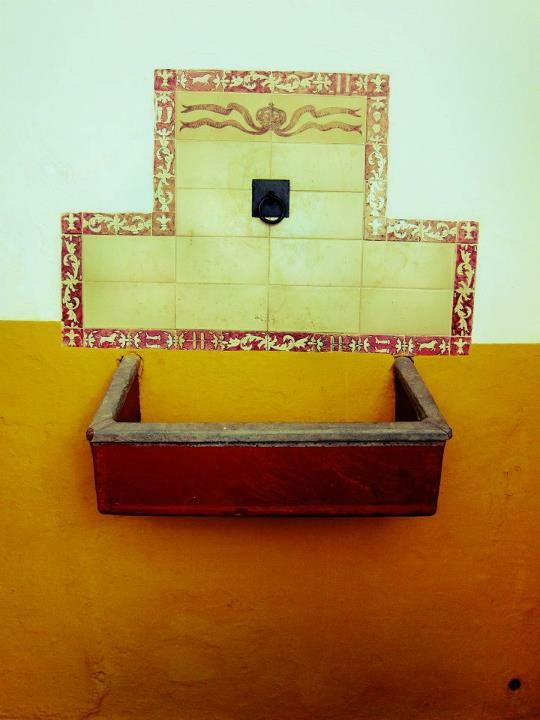 And sometimes in Casablanca you need to get off the grid for a few days. I should have seen it coming, but what started as “Let’s just drive to the mountains for a few hours, run around with the dog, and then come back to Casa” turned into an overnighter and then two nights. We can bring the dog, they will feed us AND give us a discount? How can we NOT stay all weekend? Our first night a very well intentioned café owner emerged from the neighboring tent with an apple and an orange for desert. Out of sheer self preservation I snatched up the orange before Max had a chance to notice the apple was swimming in water that I was sure hadn’t come from our laser purified tap at home. Max, loyal to hospitality at all times, ate part of the apple while the man was looking and then slipped the rest into his coat pocket. * We try to stick to a fresh fruit code while eating on the streets: If it has a peel you can risk it, but if not….make sure you are staying somewhere with a nice bathroom. Max did indeed spend the first night of our weekend away in the beautifully tiled bathroom, hovered over the toilet. “Away”, “Secluded”, and “Retreat” all sound awesome until you imagine yourself waking up the guest house proprietor and making him drive you 4 hours back to civilization in the middle of the night. With a dog who will no doubt bark the whole way . But my man is resilient and he was right as rain the next morning. 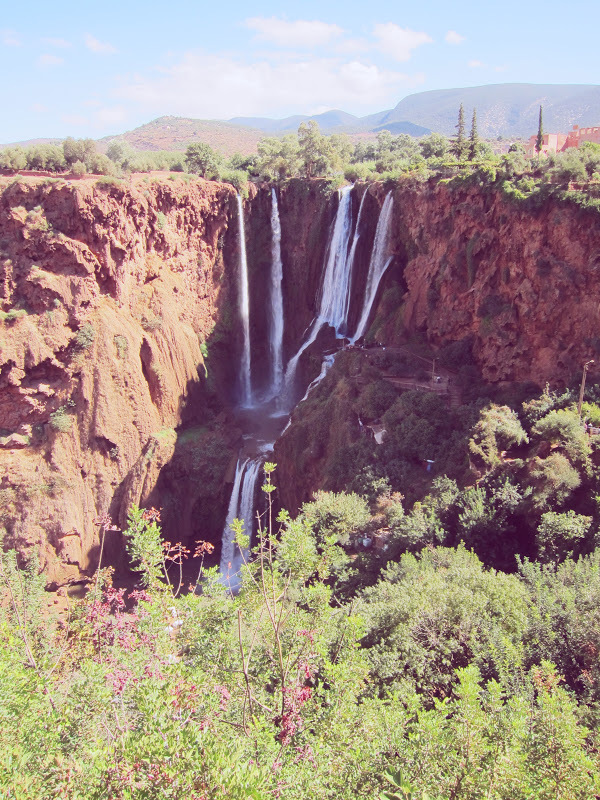 We spent the weekend hiking around the falls, haggling for carpets and trying to avoid the Barbary Apes that a nice French man told us sometimes attack dogs. 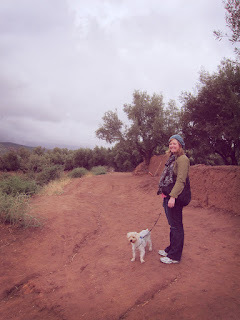 If you think it’s ridiculous for two Americans to hike around the Atlas Mountains with a small Yorkshire Terrier tucked under one arm - it is. *A note to foreign service hopefuls: Be prepared to eat food you know will make you sick. Diplomacy is as much about getting diarrhea from a generously offered apple – probably more than once - as it is anything else. 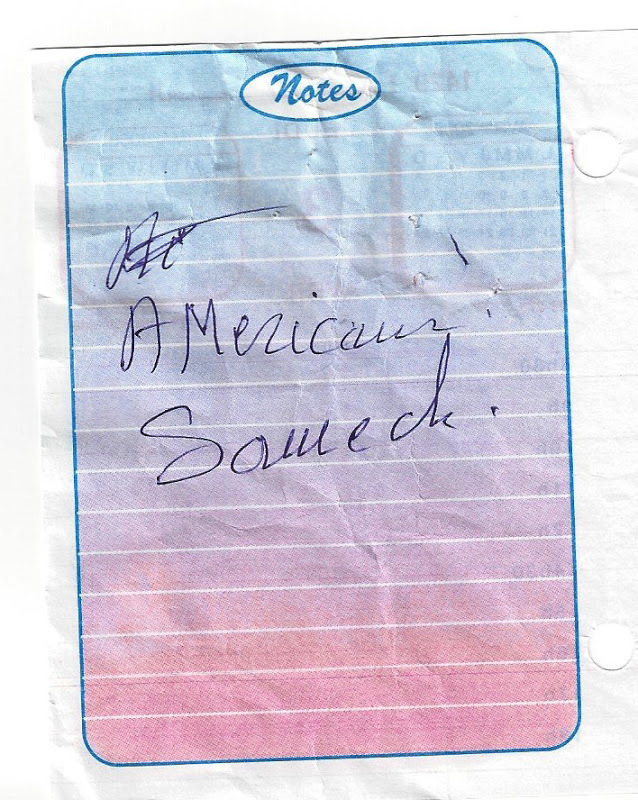 For some reason this note pinned to the back of the pants I picked up at the tailor's on Saturday made me so happy. It probably shouldn't have since this nice man has tailored almost everything I own at this point and we should be on a first name basis...but he's taught me all the french words for "please take the waist in a million inches and let the rear out about as much" and that's good enough for me. But either way, it makes me happy to have established routines and familiarities with the people in my neighborhood. 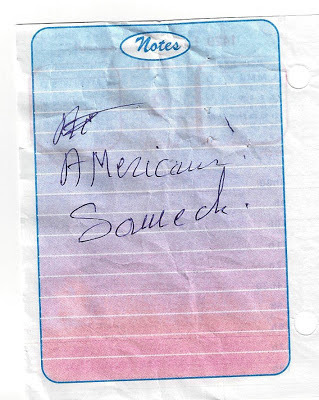 Even if they do know me simply as "American". I'm also not concerned that he's spelled it in the masculine form...should I be? Anyone think this looks like a picture from a parody folk album cover? We had at least some idea of what we were getting into when we joined the Foreign Service. We lived in Jerusalem before joining and picked the brains of all the Foreign Service officers we went to church with on a regular basis. 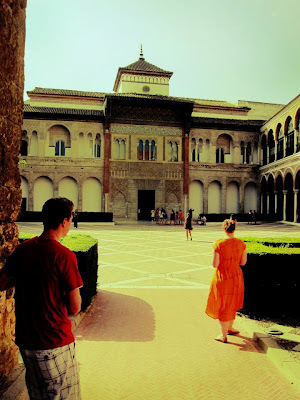 We figured out what things we could do without, what made our house a home, and tried to articulate and grow the characteristics that made for successful Foreign Service experiences and less successful experiences - to the extent that you can tell those kinds of things from being a nosey norah. We focused on things like resilience, flexibility, emergency preparedness, ingredient substitution, and of course, amazon shopping. But we never thought about pets. And then last year we got an adorable puppy who took over my heart and is slowly taking over my bed. And then the other night he hopped up on the table when I wasn't looking and ate the last bit of tagine I made for dinner: beef with caramelized onions and raisins. Both of which are highly toxic to dogs. Of course we panicked and then googled around and then panicked some more. Evidently, some dogs who eat even a small amount of raisins can go into acute renal failure within a short period of time and if not aggressively treated, they can die. We called our local vet's emergency number (since it was almost midnight at this point) and he assured us that since everything was cooked and Buckley hadn't thrown up he was fine and he'd see us in the morning. But the internets told me that being cooked didn't matter and that we should induce vomiting (which I only now know I can do at home with a teaspoon of hydrogen peroxide). So we called our vet in the US. She told us to take him in immediately and induce vomiting. Then we called our state's Dog ER number (yes, there is one of those) and they told us to take him to the vet immediately and induce vomiting. We called our vet back and explained that if we could get the stuff out of Buckley's system in the first two hours he wouldn't have time to absorb the toxins and we could avoid IV's and dialysis machines later on. But you know what he said? He'll be fine, I'll see you in the morning. And then stopped answering our phone calls. So we called another vet in Morocco that we'd worked with and he said the same thing*. So that was that. 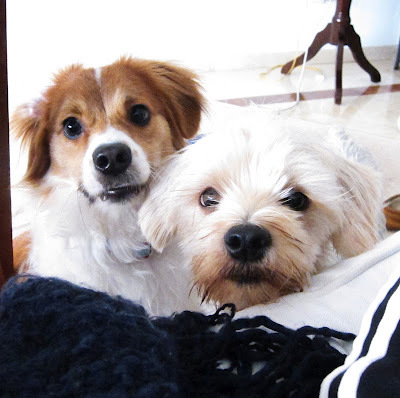 I just kept having images of the poor pupperoni going into kidney failure in the night and my hopes that the vet had all necessary doggy dialysis equipment, should it come to that, were not high. 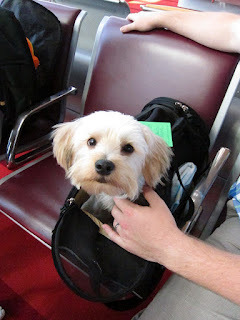 "I'm sure they don't medivac dogs" I said to Max in a panic, "What will we do?" After thinking for a minute he said "We'll drive him to Spain. We'll leave first thing in the morning and be there just after lunch." And don't think either of us wouldn't have done it. I really wrestled with whether to let my inner crazy person out on these vets and demand that they come to my house immediately because my dog needs you and don't you know my husband's a diplomat?, a course which I abhorred the moment I thought it...but still wanted to pursue on some level, and just trusting the local vets who have, no doubt, kept many dogs alive after they ate things the shouldn't. We watched Buckley for a few more hours and after he fell asleep we did too. The vet called us in the morning to see how the night went and told us he'd cleared time to see Buckley. Maybe he'd felt my death lasers coming for him in the night. After a few shots and a blood test he was given a mostly clean bill of health. We have to administer something to him every morning to help his body flush the toxins, but he's back to his table hopping self. I'm pretty sure when it's my child I will let my crazy person out, but it's not something I'm looking forward to. Maybe we overreact in America about this kind of stuff sometimes, but not having the option to overreact feels terrible. Anyway, all's well that ends well. We are dog sitting this weekend and a puppy sleepover was just the thing to set everyone's crazy meters back to normal. 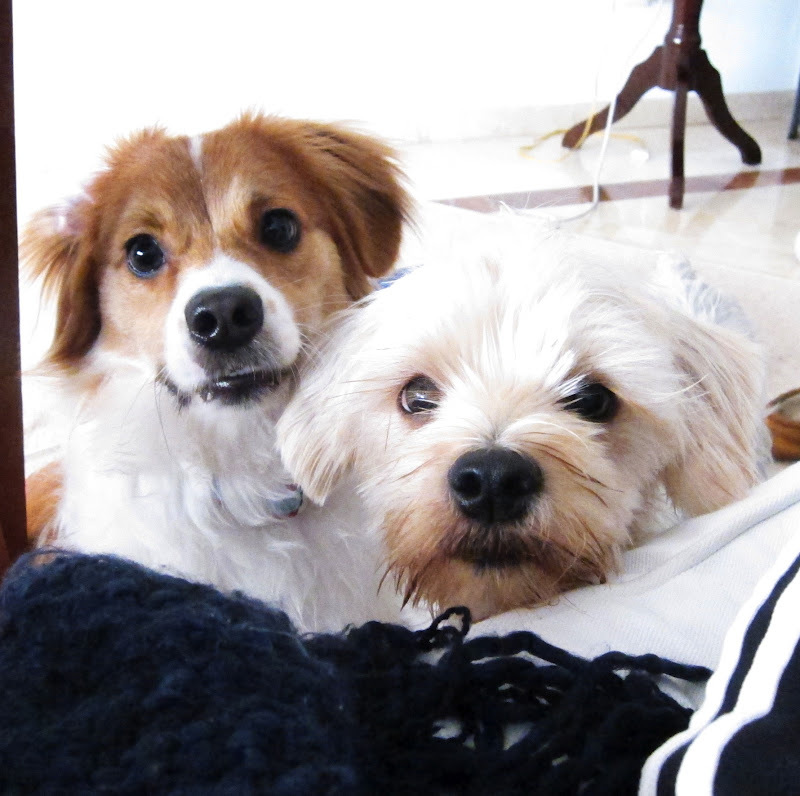 *It might seem like I overreacted, but I'm a first time dog owner. Cut me some slack. I’m pretty good at writing about silly things like omelets and trips to the market, but when it come to things that matter I feel a wee bit paralyzed. Bare with me. It’s been a little over a week since the tragedy in Libya took place and violent protests at US Embassy started spreading around the Middle East and North Africa. I was swimming alone in the Consul General’s pool when I read that the consulate in Benghazi had been attacked and one person was suspected dead. Between every three or four laps I pulled myself from the pool to check my blackberry. It seemed the news was worse each time I checked. About half way through my swim I got a text message from Max, no details, that simply said “I’ll be home around 2:30”. 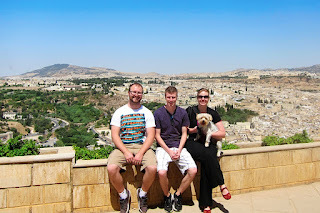 When we were in Jerusalem trouble was much easier to spot than it was last week. We experienced several “Days of Rage”, tenuous check-point crossings and bus rides through Mea Sherim lined with burning garbage cans. We received frequent warning texts from the University and the city was tense on a regular basis. Everybody felt it on busses and in the streets – no one was exempt. In Casablanca last week, the sun was shining, the streets were calm and the pool was the perfect temperature. It’s unnerving to be singled out. The protests in Casablanca were not very large in scale or violence compared to other countries in the region. We were incredibly supported by our local police and since Friday things have remained fairly calm around here. All the same I spent the better part of last week reviewing emergency procedures and updating our go bags. And thinking about and checking in with friends. We NEA-ers are a small bunch and my heart is with everyone who has been a victim in these attacks. Not just those who have lost loved ones, for which I can’t express enough sympathy and support, but for all those who have lost their sense of peace and safety as well. Hang in there. The first afternoon Max spent at home, the day after the attacks when people started to realize how big this thing was getting, I began a distance Arabic course I had signed up for in June. You know, so we can go to more Arabic speaking countries. I have all sorts of statements of noble commitment to the Middle East running around my head, mixed with a little bit of fear, confusion, sadness and anger at the lives that were lost. I’m not sure what to do with it all, but I imagine a good chunk of the Foreign Service career is spent trying to work through stuff like this – on a global scale as well as on a personal. We are pooped. Burned out. Kaput. We had a rip roarin’ summer and are paying the price. All we want to do after work and on the weekends now is pull the shades down and catch up on whatever show we are obsessing over that week. Downton Abbey, you are in my sights. But I wonder if this isn’t just a post summer breather and if this kind of thing happens when you find out your next assignment in the Foreign Service. We hit Morocco pretty hard our first year and a half and now it feels like our exit is just around the corner. I’m hesitant to grow more roots as they are soon to be torn out. But to be completely honest, we’ve also blown most of our travel budget for the year. We’ve taken to calling our self imposed hermitage “_______ Family Austerity” (names changed to protect the innocent) and we mean it. Birthday trips to Thailand don’t grow on trees. BUT this down time has reminded me of all the lovely, simple things that add up to daily living. I’ve been making ice cream and prepping the last of the summer vegetables for winter soups. I’ve remembered that I like to read and even started writing again. We’ve revived the family band and started working on new songs. 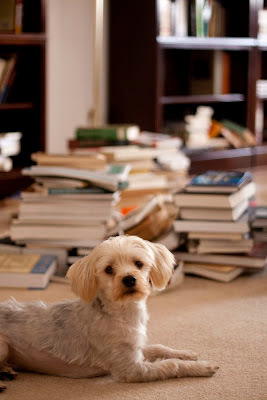 Max and I finally tackled the sorting and organizing of our massive book collection – this being the first time they’ve all lived together – and it was as satisfying as we’d hoped. I went to the Marif market on labor day to search out some herbs that have been evading me for weeks. (And when I found that mountain of basil, I bought it. All of it. I’ll not dwindle away in a basil-less winter). As I picked out shrimp for our green curry (thank you dread locked French man) I started asking about the other fish on display. The fish monger was very helpful, even explaining how to prep and cook different fish. I was just starting to feel warm and fuzzy about my trip to the market and my ability to engage with locals when he asked “Are you married?” We went from “This is Red Snapper, cook it with lemon” to “Are you married?” in seconds. Bien Sur! I said. Even though of course! is a bit of a strange answer to that question. Plenty of people aren’t married. My husband is at home with the dog. I said in French. He laughed and put my shrimp into a purple plastic sack. And that’s a nice thing. A husband at home with the dog. Dinner to cook, books to read and nowhere to go. 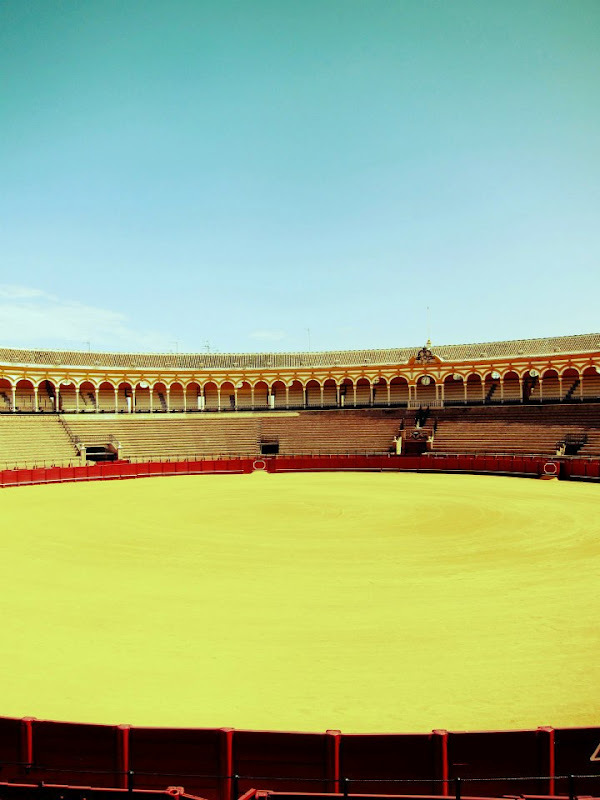 Seville is a terrific city. Even in August, 110 degrees, it's a terrific city. While it's true we had to bolt in the night from a hotel with no AC to the blessed icebox that was Hotel Madrid, we had a fantastic time in Seville. We woke up early, stayed out late, and participated in the siesta tradition...to excess. I don't think 7 hour naps are what the Spaniards had in mind. I didn't get any picturse of the flamenco show we saw, but believe you me, it was the most beautiful, captivating thing I've ever seen. One woman, in a sweltering lamp-lit room dancing to beat back the devil. Or, probably more accurate, considering the latin reputation for romance and sensuality, to seduce him. That looks very familiar...Those Moors were everywhere! 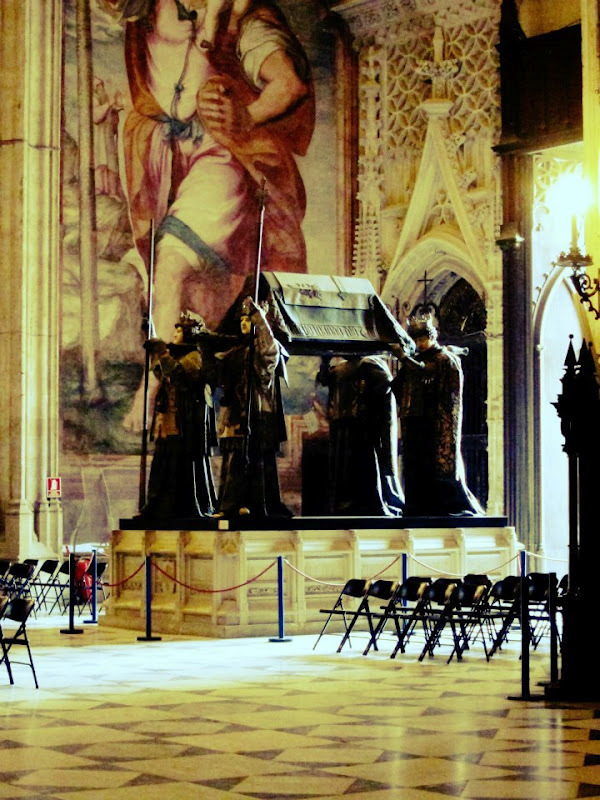 Basillica Macarena - this church has a life sized "statue"
authority, wears undergarments beneath her robes. 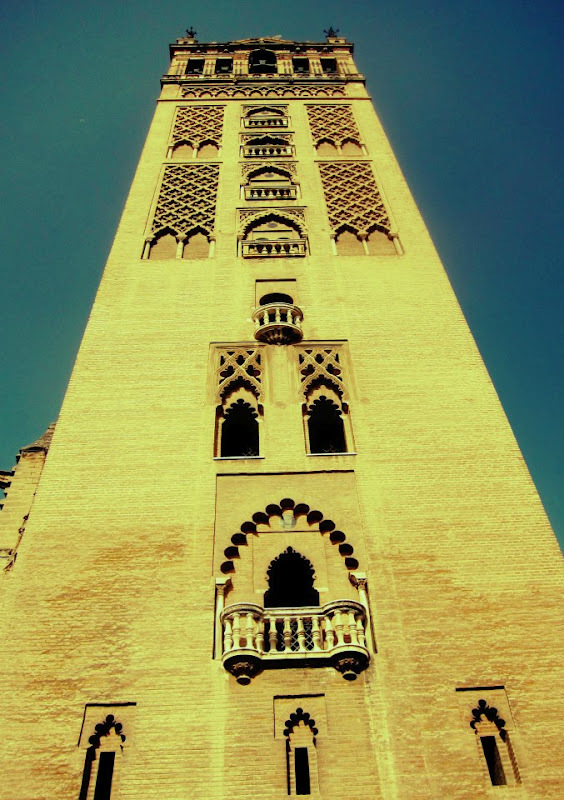 This tower is sister to the mineret in Rabat and Marrakesh. simply turned it into the Seville Cathedral's bell tower. 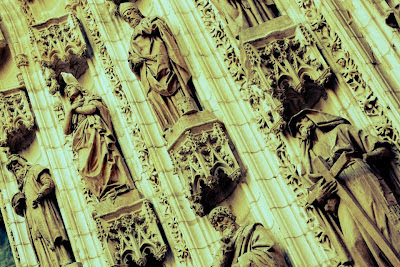 What's a Cathedral without a lot of statues of saints? After some pretty serious "will we, won't we" over the last month it's finally official. We are headed to Muscat, Oman in the summer of 2013! We are beyond excited. 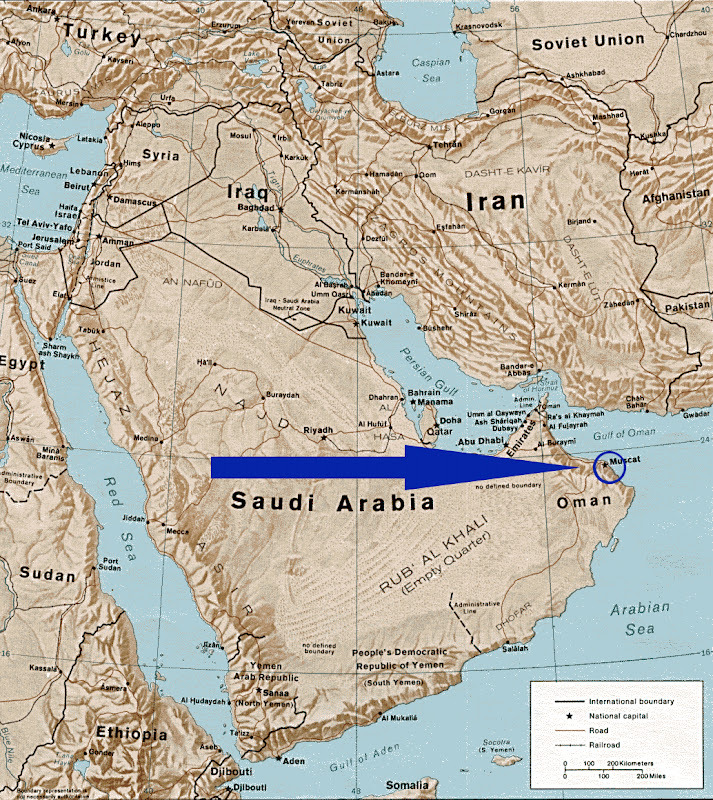 Oman is on the tip of the Arabian penninsula, across the Straight of Hormuz from Iran. 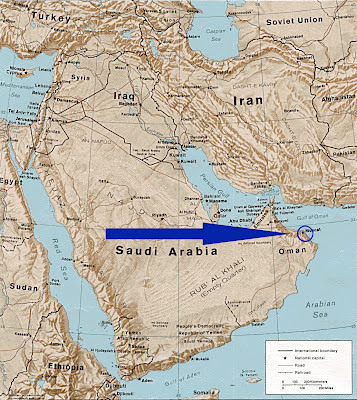 It borders Yemen, Saudi Arabia and the U.A.E. Despite some rowdy neighbors, I've heard Muscat is a lovely, safe, interesting, clean, low key, wondrous place to live. And hotter than hell. I left out hotter than hell. 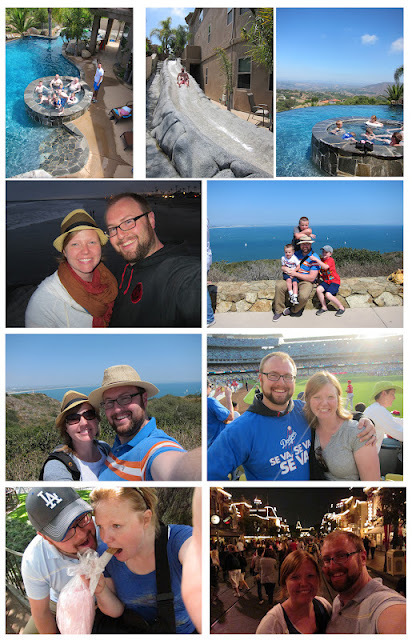 Last time we were assigned to a place we'd never been I listed all of the reasons why it was awesome on our blog. After having actually lived in Casa I re-read that list and laughed heartily. "It's clean and safe" being my favorite. It's not terrible in those areas, just not the utopia I had imagined. So, I'll avoid projections and what I have gleaned from google image searches and give you the facts. - Muscat is the capital of "The Sultanate of Oman" Kings and Sultans are our thing, I guess. - There is a "Little India" in Muscat. What in the Chicken Tikka Massala? - A double 30th birthday celebration in Thailand sound awesome to anyone else? - The culture is more conservative than Morocco. Hello again long sleeves. What I'm looking forward to most, outside of doing outdoorsy things and photographing the amazing landscape during the three months Oman isn't a furnace, is learning more about this part of the Arab world. We are literally going from one tip of it to the other and I imagine the differences are stark. Much more to come as things develop, but for now I think I'm spent. One last thing: we've never been to the gulf before - any one have tips, books to read, or "heads ups" for us? These are the last days of Ramadan and the streets are empty when I walk the dog. Every morning I see the aftermath of what must have been a killer all night party. Garbage litters the abandoned streets and sloshes of Harria soup stain the sidewalk. Bits of bread and chicken remain under cafe awnings where they were haphazardly dropped at Iftar the night before. The street cleaners are leisurely in their morning duties, if not down right negligent. But the dog doesn't mind the mess. 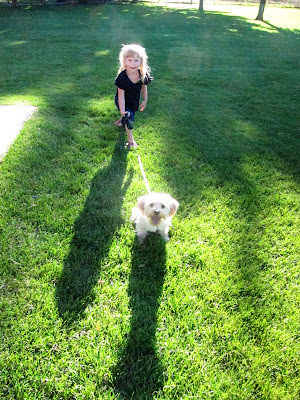 In fact, I have a suspicion that early morning Ramadan walks have been his favorite to date. This morning he chomped at some chicken bones, nosed through a mound of moroccan bread, and attempted a good old fashion "roll in the yuck"...in something that looked like yuck. Now that Ramadan is over there is a kind of palpable, collective relief in the streets. People are back to their afternoon coffee and they can face the August heat with a robustness they haven't felt in weeks. There is a sense of accomplishment that they have managed this feat yet another year but also of sadness that the family gatherings and feasting and supplication are over. So, we left R&R after being surrounded by our large and awesome families prepared to face some “people we love” withdrawal. BUT, some of the people we love came home with us! Well, one of them. Max’s brother Augie spent about 2 months with us this summer. It has been beyond fun and we were very sad to send him back last week. But we definitely made the most of it. We’ve been all over Mohammed’s Kingdom (as we’ve taken to calling it) and tried to give Augie a diversity of experiences including, but not limited to: Riding a camel, …eating camel (not the same one), wearing a snake around his neck, haggling with cab drivers, buying a fez IN FEZ, swimming in the Atlantic, hiding from belly dancers, rocking out at an African music festival, hiking around roman ruins, gorging ourselves on tapas in Spain and sweating it out at the Turkish baths. Augie was so awesomely well liked and made so many new friends, that last week I was at a work event and someone approached me (me, who has been here for 16 months) and said "Hey, you are Augie's sister in law aren't you!?" Pretty great. I think of myself as pretty good company, but it has been really fun for Max to have his little brother around this summer. Family visits have been increasingly few and far between as we have traveled and taken jobs away from home. It’s pretty sweet when home comes to you. - yes, that's our pupperoni in the background. This is how Mr. Buckley felt by the end of the summer. We are actually in our 13th day of Ramadan here in the Maghbreg and so far so good. Ramadan is a holy moth where Muslim's fast from sun up to sun down. We spent our first Ramadan in Jerusalem and I've come to feel very fondly about it. I know that a lot of expats are annoyed that restaurants and stores are closed , but you know what? We are in someone else's country and this is what they do. Deal with it. On a less soap boxy note, I dare you to listen to this song and not have it stuck in your head for weeks. These guys came to post last year and, if you'll recall, I introduced my first (and last, let's be honest) hip hop concert...in a suit. I was just beside myself about what to wear but even if I had wanted to dress the part, I have the closet of someone who shops at whole foods and arranges doggy playdates. So I wore a suit - it was work afterall. We were rifling through the bulbous green figs together - searching for soft, but not squishy specimans to fill our sack. 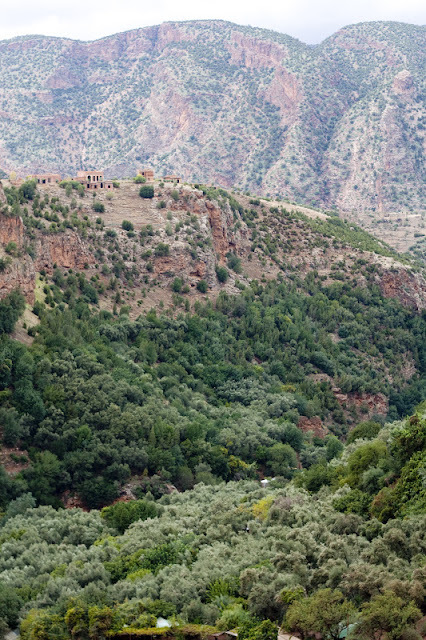 The Moroccan woman leaned over to explain, in French, how to pick the best figs. I told her that I only spoke a little French and didn't quite understand what she had said. She switched to Arabic which I understood even less but after a few sentances I realized that she was asking where I was from and Ana men Amreeka (I'm from America) and she has family in America and she'd visited California and Las Vegas and the Mountains and she loved it there and it was very beautiful. I didn't understand all of it, mind you, and my ability to produce a reponse consisted solely of the Arabic equivalent to "That's great. Wonderful. Nice to meet you." But I (mostly) understood her!! Arabic is coming much slower than I'd like...because I'm working much less hard than I'd like if I'm being honest. BUT it's coming and I have big plans to carve out more Arabic time in the near future. Including aimless dog walks through the city - once the heat breaks and Ramadan is over of course. I'm dedicated, but not overly dedicated. You know? P.S. If you want to know how to pick the best figs....you should probably google it. I missed that part in both languages. "...Where at Least I Know I'm Free"
Possibly a touch too dramatic 4th of July songs aside, I did want to share some awesome American-ness. A few months ago I was visiting a local university in my Public Affairs capacity. If I remember correctly, on this occasion I was facilitating a presentation about the American Presidential Primaries and we actually had a mock Republican Primary. An aside: there was only one vote for the completely unheard of John Huntsman and when I asked the student what motivated him to vote for this man he said “In his picture he is riding a four wheeler across the desert. That’s awesome.” So there you have it. But after the presentation a student approached me and asked “Why can’t women wear the head scarf in America?” It caught me a bit off guard but I was able to say “People are free to practice their religion in America and women can, in fact, wear the headscarf.” We talked a little bit about the separation of church and state and the bill of rights and I have to admit, as I walked out of the University campus I got a bit choked up. I’m not a sentimental person and I don’t get worked up about a lot of things; but the reality of what the values we hold in America mean in practice really struck a chord with me that day. And many other days since moving overseas come to think of it. It’s a big deal and yes, I’m proud to be an American. Disneyland (read "churros"), vacation home with a WATER SLIDE, Dodger's game (of course we had Dodger Dogs), San Diego with the nieces and nephews, California sun and tons of time with family. That about sums up the last portion our home leave. They are called avoidance behaviors and I've got some. For example, instead of thinking about and working on three very stressful things with fairly immediate deadlines...I'm going to write about our R&R. You do what you have to. 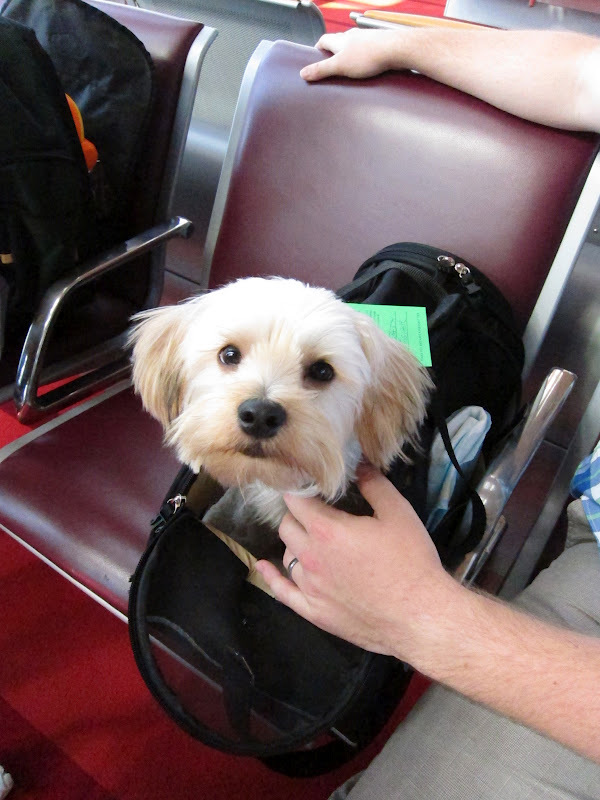 First things first - Buckley was a champ on the plane. He just sat in his little house under our seat (and sometimes in his little house on our lap) and remained quite the entire trip. We flew to Paris, stayed over night at an Ibis more reminiscent of a prison than a lodging establishment, and then took the 11 hour direct to Paris. The trip home included a 4 hour stint circling the great Salt Lake before an emergency landing (our first) followed by a 6 hour rerouted red eye to New York and a 7 hour leg to Casa on what seemed more like a floating mall than an airline. (The hair pulling! The eyeliner!) And through it all, Buckley just hung out in his little house calm as can be. I've never been prouder. Seeing family and friends was awesome. More than awesome. I don't know if this is symptomatic of FS life in general or of being in a small post with a small American community, but you kind of get into the "life is work, work is life" zone. It's hard to keep your work life and your home life separate and sometimes you feel like the two are all hogglewashed together. An R&R does exactly what it's supposed to - gives you a minute to come up for air and re-prioritize. Revisit all the great people and things that motivated you to take up this lifestyle in the first place....and provides you opportunities to eat all of the Mexican food and pork products you can get your hands on. A few months ago Max got it in his head that his high school band should get back together and play a show. And then somehow I got it in my head that we needed to rent a giant bowery, invite several other friends who were in bands and throw a big concert in the park to see all the people we hadn't seen in ages. A few emails, a friend with a DJ business and a sweet audio set up, and a letter to the city council later - we had ourselves a concert. It was just like I dreamed it - good tunes, reminiscing with old friends, families spread out on blankets in the grass, people playing catch with their kids and running around with their dogs. My own American utopia come to pass. 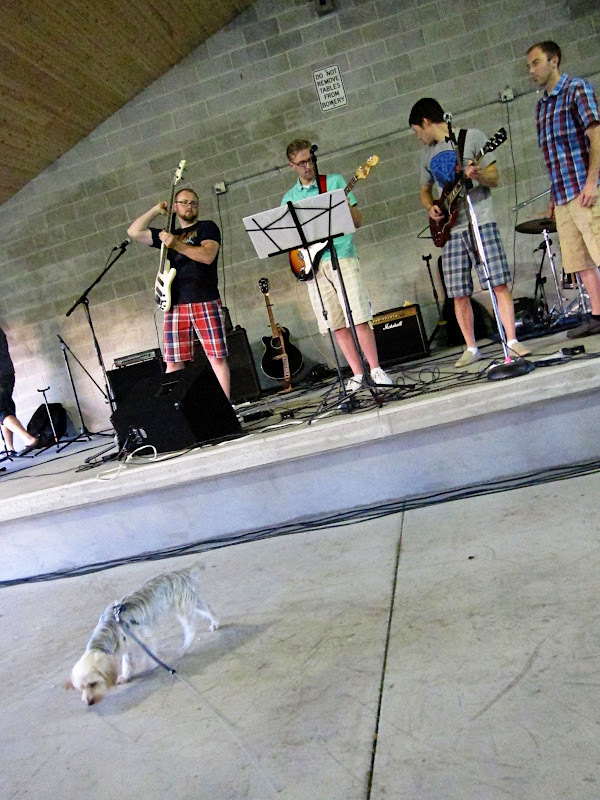 And, if I'm being honest, Max's band waled. They were even better than I remember them being in our high school auditorium. And who doesn't love being married to a rock star? around Buckley, who was just her size. So, I'm cleaning up a little at our fantastic, unbelievable, infinity pool to the ends of the earth Southern California vacation house and I see a churro left over from a pit stop earlier that day. Just as I'm wiping the cinnamony goodness from the corners of my mouth my wee nephew, part 8 year old, part ocean liner, walks into the room looking for the last churro that has been lovingly saved for him. "Do you know where my churro is?" He asks in a panic, eyes round as frisbees. I can't remember the last time I felt this ashamed, so I hemmed and hawed until he left the room looking for it elsewhere. When I didn't see him for a while I thought I'd gotten away with only the intense personal shame of stealing treats from a child instead of the public humiliation I deserved, but then he trudged up the stairs with the most enormous alligator tears I've ever seen running down his round face. "They saved one churro for me and some idiot walked by and ate it!" He sobbed at me, looking for answers. You know why? Because adults have answers. They help kids find lost things, they sympathize when idiots walk by and eat your churro...they don't eat your churro and then hide it from you. For some reason I felt like my first step was to confess to his parents and they, of course, laughed, because it's kind of funny and they are nice people. But I made Max drive me 20 minutes to the nearest town to buy him another one. It was only after we left the gated community that we realized we didn't know the code to get back in and that we'd left our cell phones back at the house. In the end we found a solution that didn't include scaling the gate and running up the hill to our vacation home AND the churro was delivered without me having to forever break the trust of my churro loving nephew. Churro-gate aside, vacations are awesome. So awesome, in fact, that I'm just getting around to blogging on the next to last day of ours. Our R&R has been so terrific. We got to see lots of friends and family, we ate American food that was bad for us but tasted amazing, we went to Disneyland, and Max's high school band got back together for one giant concert in the park where we rocked until the sun went down (and the sprinklers turned on and almost ruined our equipment...) I'll blog more about getting to know America again, but right now Max's brother's are building a human train down the waterside with the lights off and it's pitch black. How could I miss that? 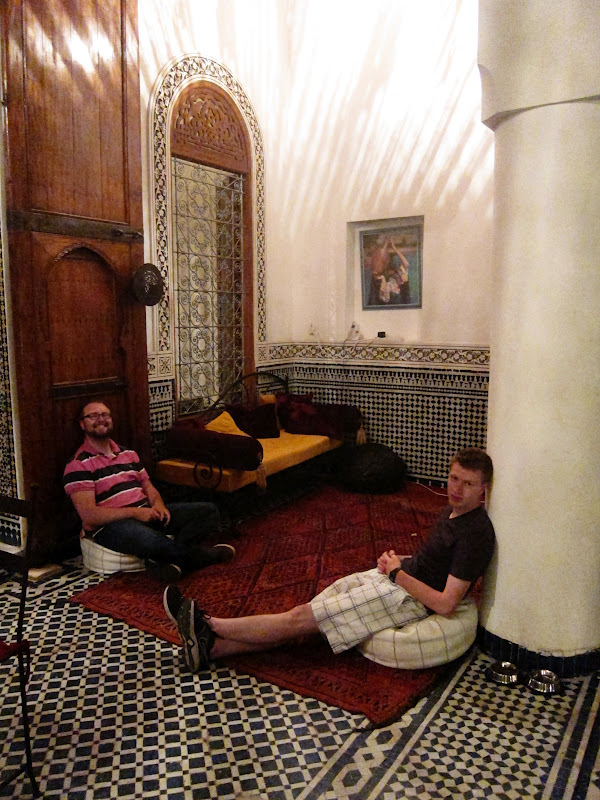 On April 22 Max and I hit our official year mark In Morocco. 12 months, 365 days, holy smackers. We have been away from home for a bit longer than that, but we are certainly still State Department babies. I started learning Arabic and I’m pretty serious about it. I am learning to watercolor, mostly from books and youtube videos of old women wearing kimonos, but it’s something. 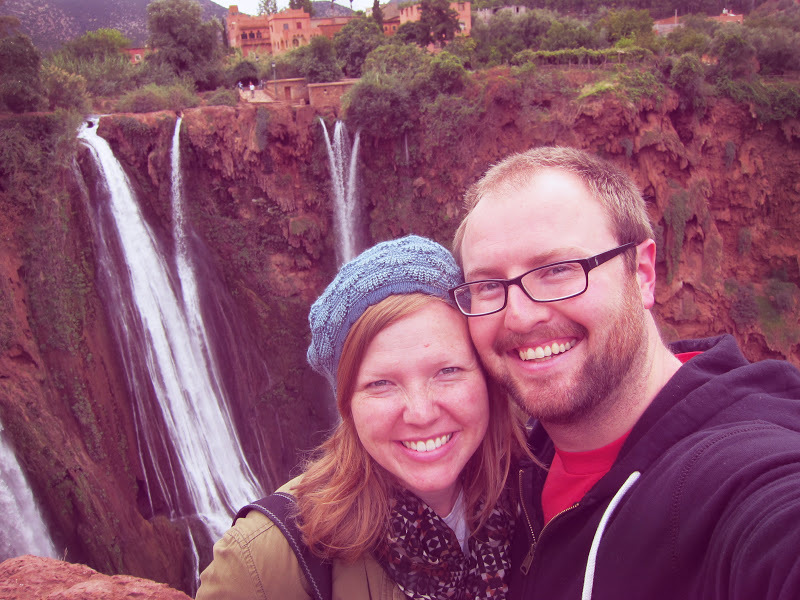 We have visited 19 cities in Morocco and 4 countries since moving here. And over the last year we’ve decided to adopt. When we came to Morocco we were on a “thinking about babies” hiatus. Once you start exploring medical options things get real hairy and real expensive real fast. There are a gaggle of options ranging from the very simple to the totally invasive; the reasonably priced to the “mortgage your home - twice”. It’s exhausting in every way conceivable (no pun intended) and it can take over your life. We took a break from everything and somewhere along the way things have changed for us in baby land. We have always been excited about the idea of adoption, but it doesn’t make us less sad about not having biological children. I haven’t blogged much about this because it’s pretty heavy stuff. It’s primarily about loss and disappointment. Not that there isn’t something to be gained from those things – there most certainly is – I just didn’t want to share all the downs... and more downs so publicly. But adoption is about life, about joy and renewed hope. THAT is something I want to share. Max and I have met with an adoption specialist a few times and my adoption notebook is growing every day. There is a grieving process that happens when you come face to face with your inability to bear a child, but there is joy in feeling that your love won’t be wasted, that there is a someone meant to be part of your family. And I don’t talk about things being “meant” very lightly. Quite frankly, I don’t believe in fate. I don’t believe that most things are “meant to be” and that God has a top secret plan for us to uncover. I never felt strongly that we would overcome our infertility and have a biological child, but for whatever reason I DO feel strongly about the little whoevers that will enter our life in the nearish future. Well, not for a few years because of a certain “hot” post that doesn’t allow children - but I’ve said too much already! For years I've lived in baby limbo land, keeping clothes that were too big "just in case" and not thinking beyond 9 months into the future because "who knows?". But that's not living. That's just waiting around and it's no way to go about your life. Making the choice to pursue adoption instead of countless and unending alternative options was the best, most liberating choice we’ve made in a long time. To be the boss again, to call the shots and create your future instead of waiting for it to disappoint you. It’s pretty sweet. So, all in all, good year. Enough of all that serious stuff! Though, I will say that I woke up this morning with the phrase "Invest in your life" running through my head like an infomercial. What the heck? What does it mean? Where did it come from!? 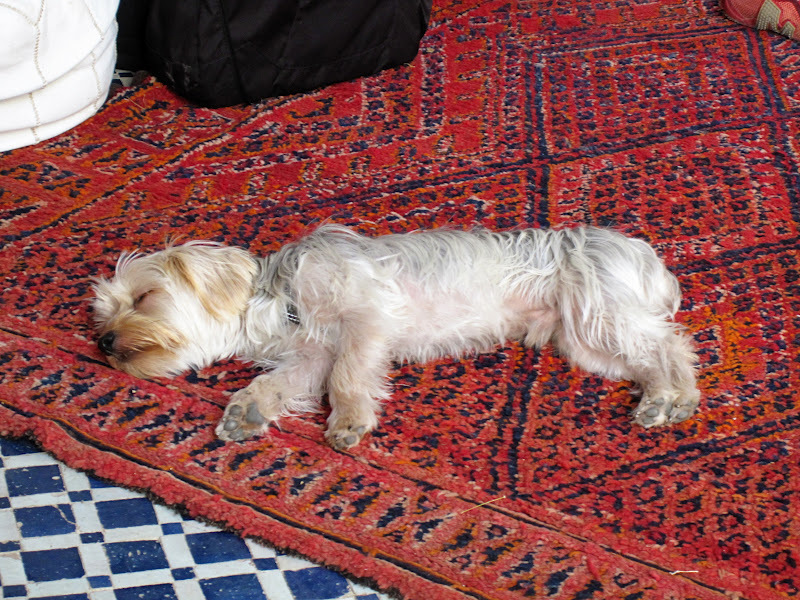 But anyway, a few weeks ago we took Mr. Buckley to the lovely seaside town of Essaouira. First road trips are always monumental and Buckley celebrated by rolling in all the fish yuck we found on the ground. And yes, perhaps he even rolled in some bird yuck. 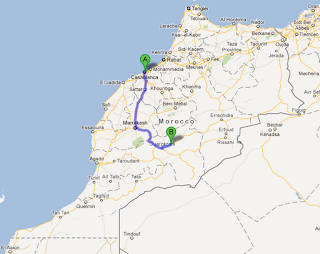 I'm always shocked at how different one town is from another in Morocco. Essaouira is a hassle free beach bum kind of place with the freshest fish in Morocco (Don't tell the city of Safi I said that) and a Bob Marley-esq atmosphere. 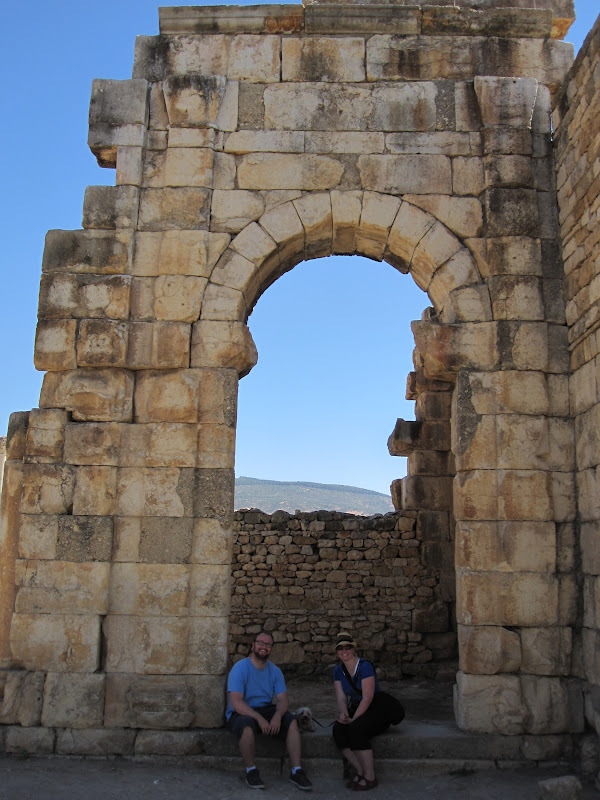 And I don't just say that because we were offered hashish as soon as we stepped onto the main square. It's just kind of...you know, groovy. There aren't a lot of things to "see" - we spent our time walking around in the Medina, checking out shops, and tasting things that looked good. 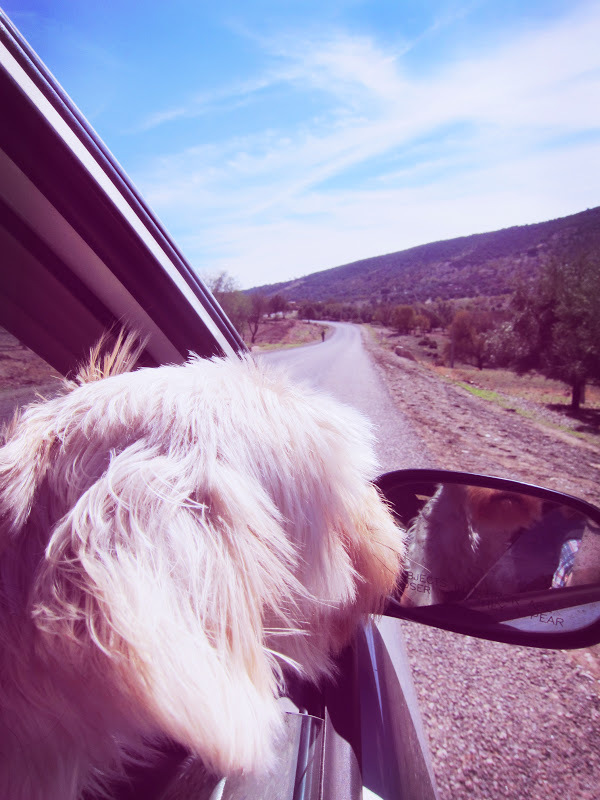 It is quite a dog friendly place and wherever we went, ere went our dog. "The Maritime history of North Africa has always fascinated me"
I discovered a few months ago that I'm a bit of a control freak. We may have talked about this before, but who can remember? So you do things like get an international flight tracking addiction. But it's good to have the illusion of control stripped from you. That's what it is anyway. We trick ourselves that we are completely in control because we craft carefully written grocery lists and come home with exactly what we wanted or we slap together swimming and then shopping and then painting and then yoga and then dinner and then family time back to back to back each day without a sliver of daylight in between - but we've chosen it and so we must be in control of our lives, right? But then you move away and all of the ways to spend your time, the things you had to choose from go away. I can't pick up the latest adult education program from my local community college and plan my Thursday nights for the coming months. I can't even rely on the shop around the corner to stay open from one day to the next. And so I get to focus on the things that I actually can control - the things that really matter. The atmosphere inside my home, the effort I put into my marriage, the order of my mind and the health of my body. Without any of the familiar cultural markers I find at home I'm both more powerless and much more in control of my life. It's a strange pardox that I really enjoy about living overseas. But then it's bad. Like when your doctor, who is very technically skilled but interpersonally challenged, tells you first that you might have a serious problem after doing an invasive procedure, but doesn't write it down and tells you weeks later that he doesn't know what you are talking about. *I'm actually a bit farther than that in my Arabic studies - very exciting! There are ways to take back control of your life overseas! The direct Delta flight from Paris to Salt Lake City has an in-cabin-pet weight limit of 22 pounds but the Casablanca to Paris Air France flight only allows 13.2 pounds. The Royal Air Maroc flight only 10. 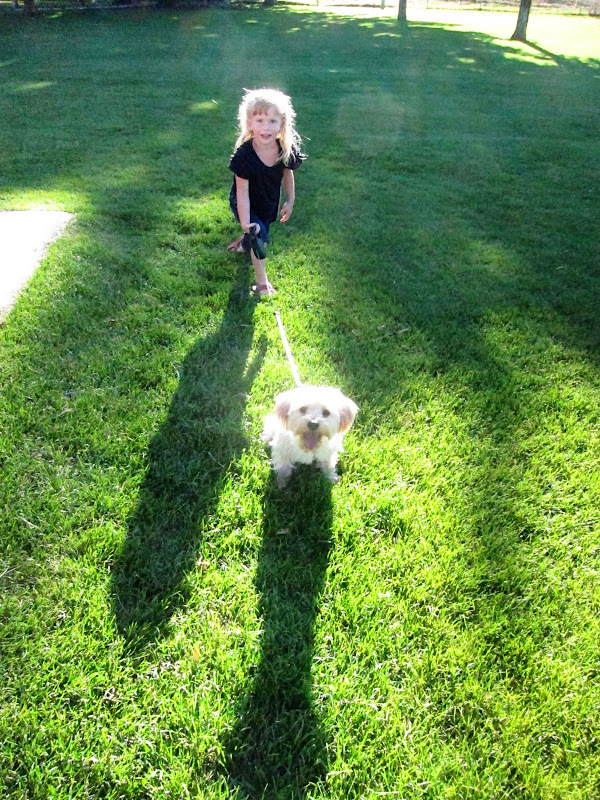 Our dog alone, on a skinny day, weighs about 9. Those limits are Including his pet carrier of which there are a variety of choices, colors and weights to choose from. The Bergen Comfort Carrier weighs only 2.7 pounds but is almost too narrow for the Buckly B to turn around. The Sherpa Original Deluxe Pet Carrier weighs 4.6 pounds but is by far the roomiest and most well constructed. You know how I know? I bought them all and I've been seeing which ones will work best for Mr. Big-End-of-the-Small-Dog-Scale. He's too small for underneath the plane, but he's almost too big for tiny chiuaua mcEurope airplanes. And Middle Eastern airlines? Forget about it. Did you know that dogs are not allowed in-cabin on several-here-to-remain-un-named Middle Eastern airlines, but Falcons are? Falcons, people. Actually, for religiuos reasons dogs are not very popular in the Middle East and so I can understand that. But falcons! In the cabin!? Or we could take Lufthansa through Germany which allows 16 pounds and then an American carrier which allows 20 pounds from Germany to Chicago to Salt Lake City, but that's a lot of airports and transfers for a puppy and his parents. I'm not comlpaining, I'm just saying, it's a good thing I like puzzles. This was actually the biggest reason I didn't want to get a dog. But I have to say, and this is coming from a former non dog liker, I don't regret it for one second. It's like something chemical happened in my brain and instead of saying "holy cow this is so complicated and I can't believe I'm putting myself through it" I'm saying "OK, how can we put all these pieces together so my fuzzy wuzzy tiny bestest dog can come to America on home leave and meet my family?" If my year ago self could see me now! We did fit tests, we did carrying tests, we put him on the scale with each bag. We measured and thought about the foot room on each aircraft, we evaluated the potty situation on such a long flight and which carrier would cause the least in flight stress. And still all four of them sat on our dining room floor, choice unmade. And then, in an act of supreme puppy wisdom, our little guy walked over to the biggest carrier, plopped down inside of it, and threw up. And voila. Our choice was made. Humans make things so complicated sometimes. And to end things we took what turned out to be a three hour detour to Telouet, the former head quarters of the Glaoui brothers during the first half of the 20th century. It's really a shame to gloss over these fascinating brothers and their mountain castle, but lo, I am going to. You need to know that they made a trechorous deal with the French that let them control the south of Morocco however they wanted if the French could control the imperial cities and the north. You also need to know that they were ruthless and extravagant. The Kasbah was decorated with fabrics and techniques and materials from all over the world. 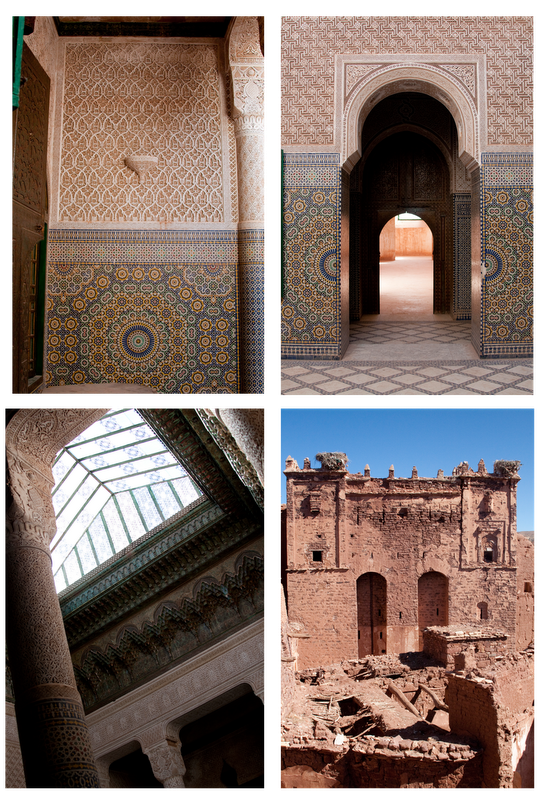 Despite it's crumbling facade, the Kasbah is amazing inside. It was rad. We gave three Berber women, who left our car reeking of camp fire, a ride back up the hill to the next town and then booked it home up and across the Atlas again. This time with slightly more road sickness, but a lot more Moth podcasts - so everything was cool. 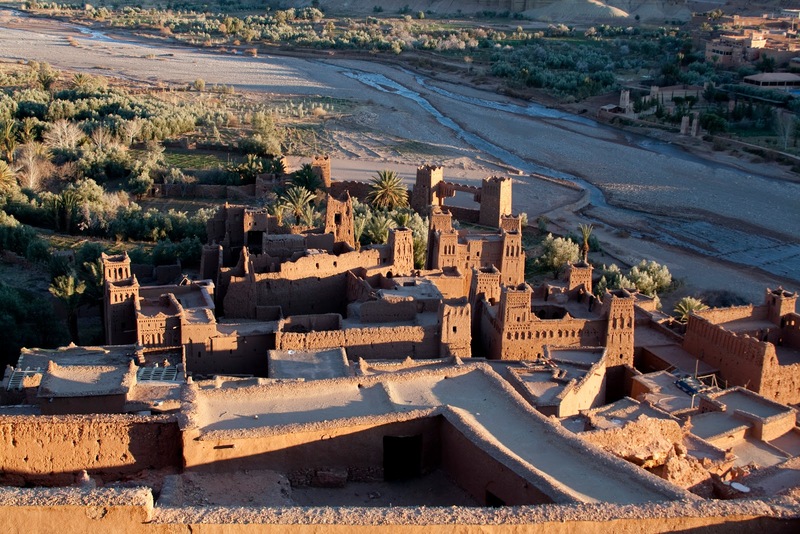 After leaving Kasbah Mchaunted Max and I headed for the city of Ouarzazate (pronounced War-Zah-Zat). I wanted to go Ouarzazate not only to get a better feel for the south and Berber culture…but also to find (and buy) one of the giant fuzzy rugs I’d heard come from the region. But culture first! 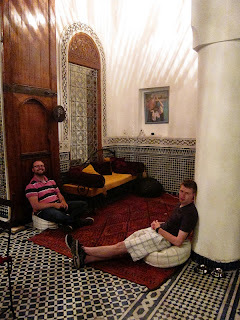 We started with a tour of the Taorirt Kasbah - former home of the infamous Glaoui brothers. 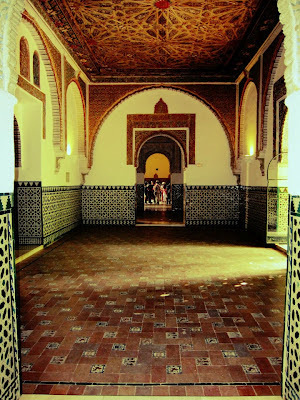 The Glaoui brothers ruled the south of Morocco with an iron fist during the first half of the 20th century. Their collusion with the French is a bit of a sore spot in Moroccan history. The brothers were ruthless, decadent, and essentially let the French do whatever they wanted in the North if they could do whatever they wanted In the south..and they did. But more on the brothers later. You know the ultra open floor plan that everyone fell in love with a few years back? The kitchen led into the dining room into the tv room into the all purpose study area without any walls or much to separate the family's activity? Well, Kasbah’s are pretty much the exact opposite of that. I read somewhere that Kasbah house staff often devised trails of string or pebbles so that they could navigate the windy web of corridors and staircases. 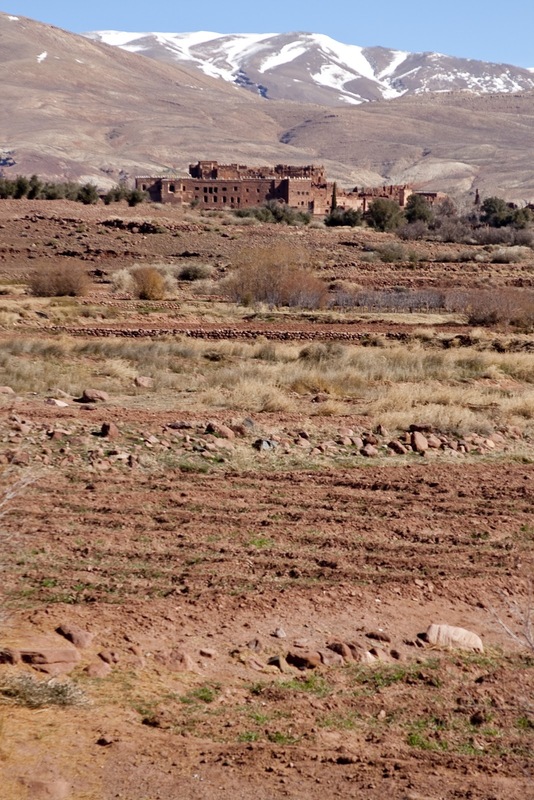 We visited Ouarzazate on a national holiday and except for a few tourist sites - including an uninspiring movie museum - almost everything else was closed. One construction worker looking man convinced us that he worked for the co-op of women with disabilities where they made rugs and when he let us into the show room with a key, we decided he seemed pretty legit. However, when it looked like we weren’t going to buy a rug afterall he moved onto other products like the “handmade” scarves sewn by blind Moroccan women. Who knew that blind Moroccan women made the Pashmina scarves you see in every Middle Eastern market all over the world? I’m no sucker. 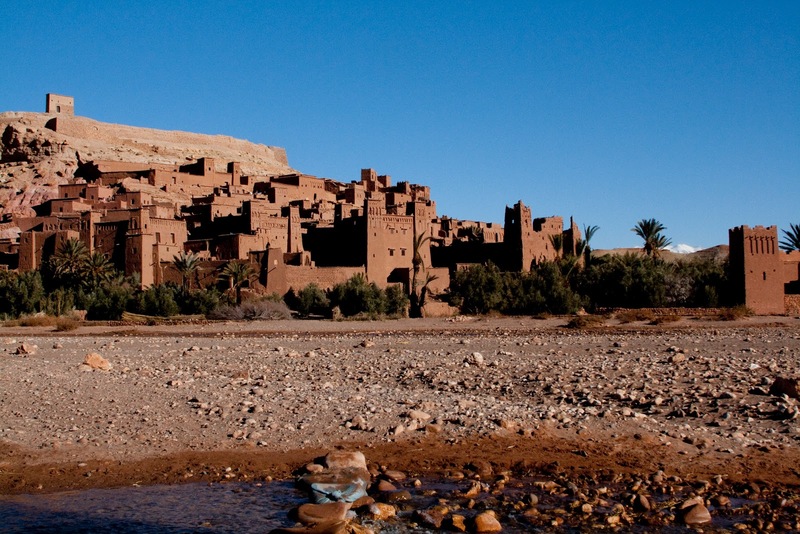 Did I tell you that I picked our Ouarzazate hotel by going to the first listing on the “expensive” page of the guide book whilst in the haunted Kasbah? That’s not usually our style, but people make crazy decisions when they are freezing. As luck would have it - it turned out not to be a crazy decision at all. The dar was reasonably priced (off season) and one of the most unique places I’ve ever stayed. 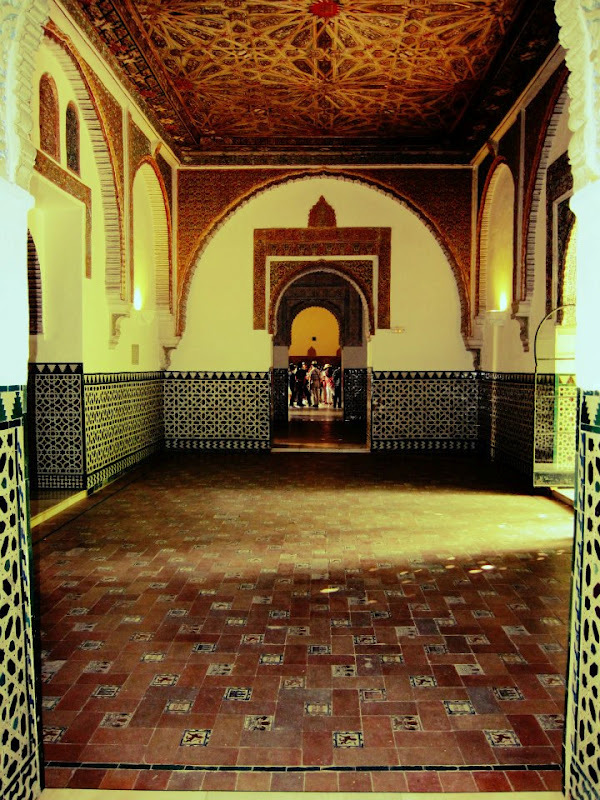 The guide book refers to its “Labyrinthine hallways” and “1001 nights décor”. 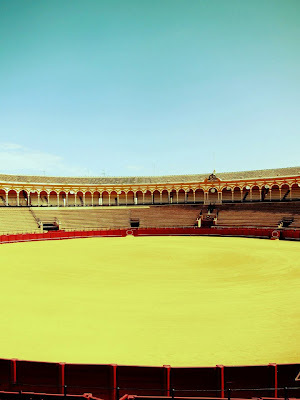 After winding around corners and up narrow staircases you step into a curtained shoe closet where you remove your own shoes and put on Moroccan slippers to tread the rest of the way across stacks of orange and red carpets. But the place wasn’t antiseptic-hotel-fancy but crazy-old-desert-fancying-Frenchman-fancy. Every room is tucked behind rugs and heavy blue velvet curtains with a very eclectic mix of Berber handicrafts and photos. 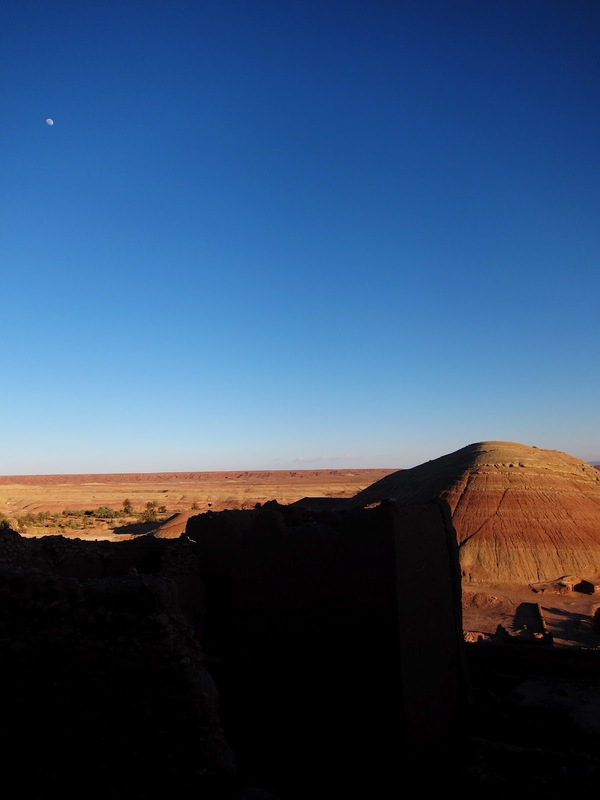 After dropping off our bags and having a nap in a WARM room we took a little day trip out to the Skoura Oasis - an hour or so away from Ouarzazate. The very nice desert-fancying-Frenchman drew us a map of where to go in order to see a few Kasbahs...but we ended up very lost. All the same, we made our way through the thick trees and saw dozens of Kasbahs peaking out from the branches - most of them still inhabited. It was really surreal actually. ....and we are lucky our car didn't fall into any ditches as the road was often times barely wide enough for all four tires! 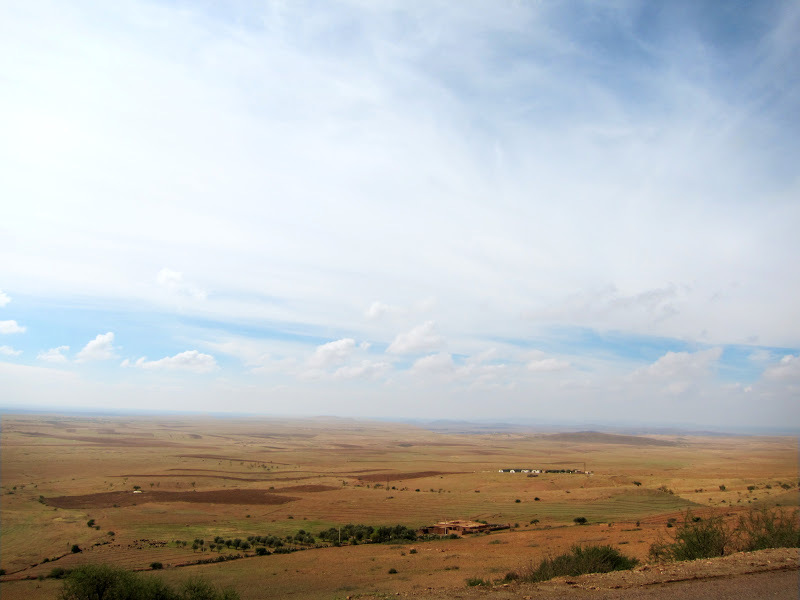 Not real rain though - Morocco is still seriously lacking in real rain this season. But in busy-ness! 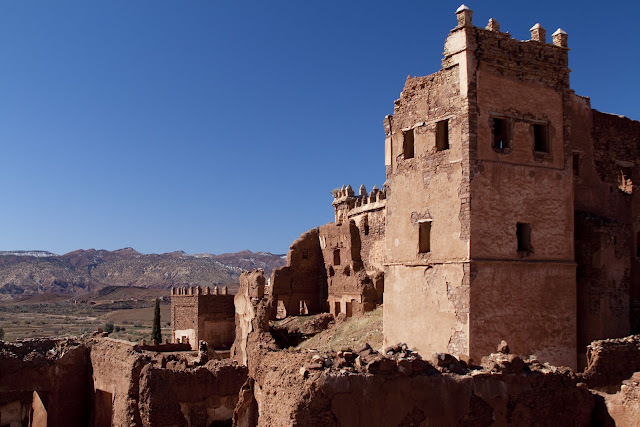 I hate to interrupt a travel story mid trip, especially one where we have just emerged from a freezing haunted Moroccan castle, but there have been some goings on around these parts. 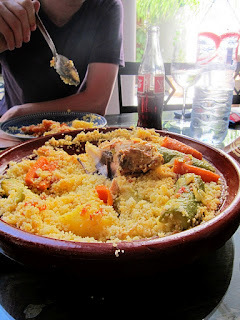 We had an "S" visit to Morocco this past week. For those of you who haven't been indoctrinated into the State Department Acronym and Initials Secret Code yet, "S" means Secretary of State. As in THE secretary of State. Of America. The consulate wasn't directly involved in the visit, but Max and I were able to meet Madame Secretary and shake her hand. I don't meet a lot of famous people but in general I don't get very hyped about it. People are people, right? But just before driving over from church to where the meet and great was held I had been chopping up Basil for a salad. In the car I realized my hands still very much smelled of Basil and oh my gosh I'm going to shake the Secretary of State's hand with my basil-smelling hand and then she'll board air-force-secretary-one or whatever it is and put her hand up to her face and say "Basil, how curious." But when I realized that was probably the worst possible outcome I got over it. It's really refreshing to have these kinds of "Big Picture" meetings from time to time. I'll spare you the sentimental paragraph I just wrote and erased about serving your country and being engaged in meaningful work, and just say that this is a neat job and North Africa is a neat place to be right now. I am still wearing a pony tail in light of mullet-gate 2012, but my hair is growing pretty fast. I have been moved from teaching the 11 year olds at church to teaching the 8 & 9 year olds and so far so good. We had a lesson today about a man who stood on a tower to teach his people and we played Jenga - it was a big hit. Max is having a graphic novel he has written illustrated and the project is at the half way point. Very exciting. He's applied for a grant that would pay for production, printing, and advertising - we'll know more in June, but keep your collective fingers crossed! We are busy planning our home leave and can't wait to see many of you. We are hoping to fit in at least one camping weekend and other fun activities whilst home-leaving. ...including buying a heavy duty new camera lens? Yes, even that.